The basis for the transformations is the cabin floor with a long wheelbase (3122 mm). Points of attachment to the cabin, to the floor and on the wheel arches already prepared, for an easier and faster assembly. Box technic body shops, is a control unit that interfaces with the CAN structure of the vehicle and provides the information of power necessary for the transformation ( additional emergency lights, marker lights, external generator etc). Broad-based indicators for the rear side. Easily converts into a vehicle with isothermal box transport food or medicines, cooler box for transport perishable foods and frozen foods. 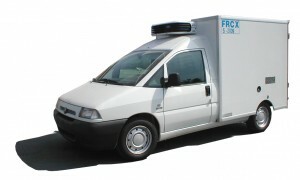 Consult our technical staff for the installation of cold storage for Fiat Scudo van.